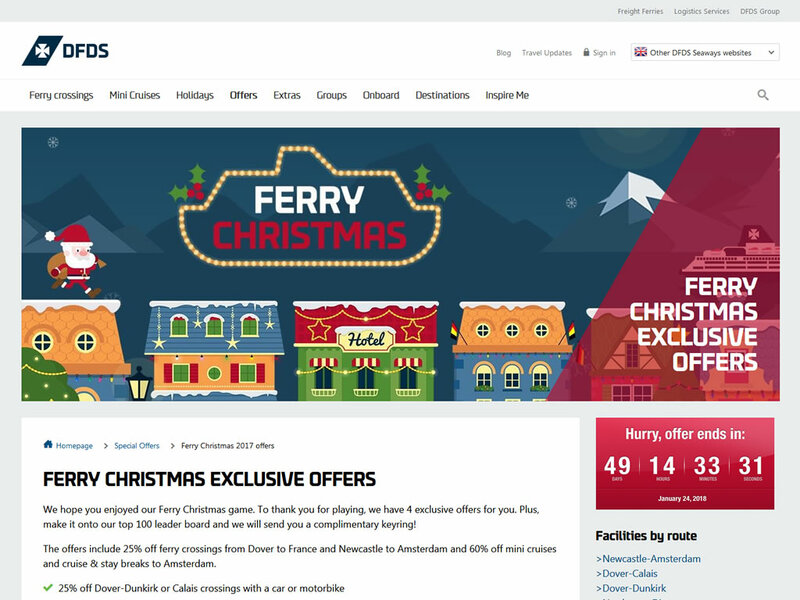 DFDS has released a Christmas game called Ferry Christmas. The premise is simple. Santa runs across the screen at a set speed. All you can do is make him jump. Jump to avoid the cats, the snowmen, and the Christmas trees. Jump to collect bonus coins. Leap from building to building. The game speeds up the longer you play it, and the obstacles are more difficult. There's a competition behind the game and the grand prize is an Apple iPad. Just collect 2,000+ points to be in with a chance of winning. The prize for the top 100 highest scoring people at the end of the competition is a free key ring! I took no less than a dozen attempts to scrape through at just 2,050 points. Hats off to Jade Currie who is currently at the top of the leaderboard with a staggering 10,557 points. Selected sail dates are included in these offers until 30 June 2018. All deals must be booked by 24 January 2018. Naturally, the mini cruise is the one I'm interested in. The discounted price means mini cruises are available from £35 per person, based on two sharing an inside cabin on selected dates. A supplement applies to Friday and Saturday departures. The Newcastle to Amsterdam mini cruise is the standard affair. Sail from North Shields in the early evening, arrive in Ijmuiden the following morning and transfer to Amsterdam city centre, catch the coach back to the port, and sail back to Newcastle overnight. The cruise and stay option means you can bolt on a stay in Amsterdam. You'll need to book a hotel separately but this gives you the choice and flexibility to put together your own holiday that is right for you. Treat yourself to a posh pad, slum it in a cheap-as-chips hotel, or why not push the boat out and stay on an actual houseboat? These are very good deals and the mini cruise starts from a cheaper price than the last 2 for 1 offer I spotted on the same route from DFDS (£90 for two). Sure, you have to jump through the hoop of playing the game but there's a very good incentive waiting for you at the end. I am sure the same offers are available to everyone who participates in the game. If you get different offers to the ones listed above, please let me know in the comments below. To access the game, click below and follow the link to the Ferry Christmas game.